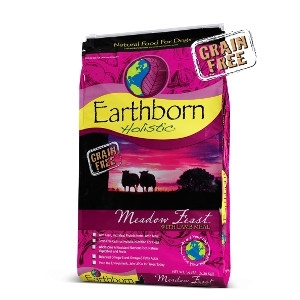 Earthborn Holistic® Meadow Feast™ is designed to provide unique nutrition for dogs with sensitive stomachs. This limited ingredient formula is a great grain, gluten, potato-free alternative diet. With premium lamb meal as a single protein source, it is easy to manage your dog's diet and he is ensured high protein levels to help develop and sustain energy and lean muscle mass. Overall health benefits also come from a precise blend of vegetables and fruits, such as peas, blueberries, cranberries, apples, carrots and spinach. Meadow Feast™ is sure to please any finicky dog. *Available in 5, 14 or 28 lb. bag.